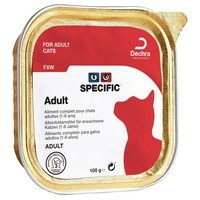 Specific Everyday Adult FXW Wet Food Trays for Adult Cats offer a perfectly balanced and complete food to meet the nutritional requirements of adult cats. Made with only high quality and highly digestible ingredients, the diet ensures an optimal uptake of nutrients and provides a moderate energy level to help your cat maintain a healthy bodyweight. Pork, Egg Powder, Fish, Vitamins and Trace Elements (including Chelated Trace Elements), Minerals, Cellulose Powder, Psyllium Husk, Fructo-Oligo-Saccharides, Taurine, Methionine.